A working sisal hacienda on its land. A small but elegant site with manicured lawns, just north of Mérida, has the bonus of an attached working hacienda that produces sisal fibre even today. The factory processing the henequén cactus into sisal fibre sits at the entrance to the ruins and the hacienda (San Lorenzo de Aké) fields are under the main pyramid. When you walk in, you will pass The Small Temple, with a round structure in front of it. Then, passing the ancient (defence?) 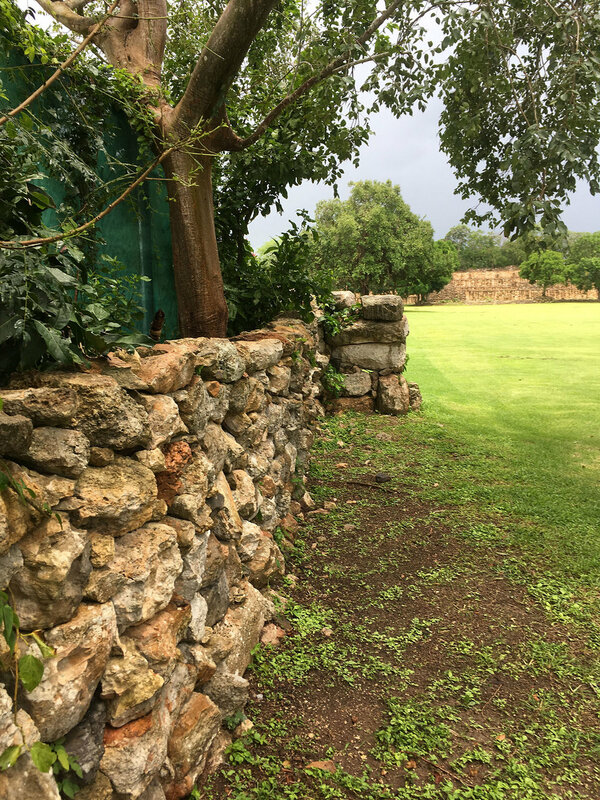 wall, you will walk straight to the main plaza, with manicured lawns, and you will immediately feel the elegance of the place. On your right you will see the large Chultún Temple (with the chultún on its top). On the left is the Palace (the Building with the Columns) and at the end of the large plaza is the Long Temple. The plaza is basically surrounded by three structures: The Palace, the Chultún Temple and the Long Temple. Like I said: small but elegant. I found a few different versions of the meaning of the name. The name Aké is a toponym (a place name) that means 'place of reeds' in Yucatec Maya. The Mayan Word Aké may also refer to a surname and therefore can also designate a lineage membership but we don't have more details on that. INAH (the National Institute of Anthropology and History) gives the name ak as a plant named bejuco (also called guaco). Native to Central America, it is a climbing plant reputed to have curative powers. Native Americans believe that guaco (Mikania glomerata) was named after a species of kite, in imitation of its cry, which they say it uses to attract the snakes, which it feeds on. Tradition says that the plant's powers as an antidote were discovered through watching the bird eat the leaves, and even spread the juice on its wings, before attacking the snakes. How powerful that connection between man and nature must have been! Yet another name explanation can be found at the site. Aké was found in a glyph that represents a hand holding a fish. That is believed to mean 'conjure clouds, storms and winds'. I rather like that. And we came here in September 2017 with my husband and it was cloudy and it rained. As if the place wanted to tell us that is the right interpretation of the name. The view from the Long Temple. The view from the Palace. Aké was occupied from around 350 BC. The buildings that we can see today date from the Early Classic era (250-550 AD). Some constructions were made in the style called Megalithic, with large stone blocks. Later they were rebuilt or modified using grouting mosaic, which is the distinctive Puuc architectural style. 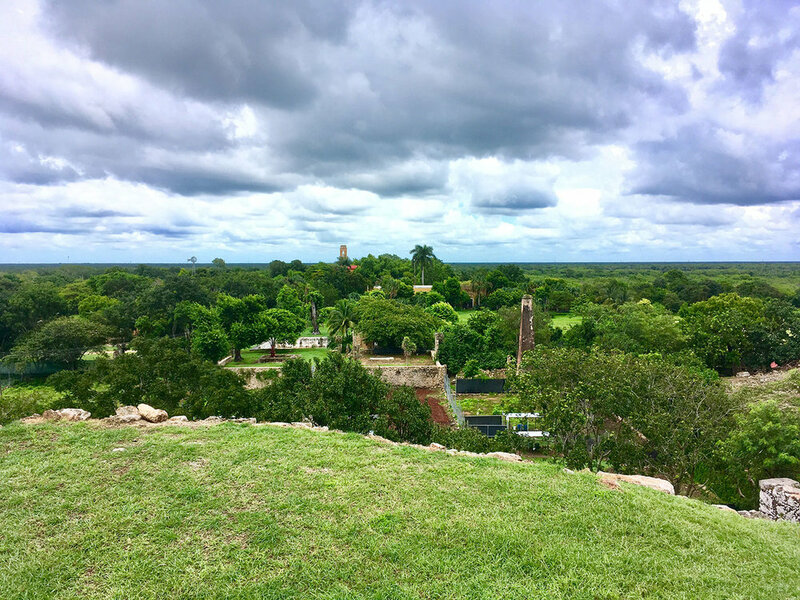 Aké reached its peak in the Classic period, between 600 and 900 AD, when the whole settlement reached an extent of 4 km2, and it became one of the most important Mayan centres of northern Yucatán. The Franciscan priest Diego de Landa in his book Relacion de las Cosas de Yucatan recounts that the site was founded by Kukulkán (the Mayan name of Quetzalcóatl, the Toltec king who conquered Chichén Itzá), after the fall of Chichén. It is presumed that he meant Kukulkán II of Chichén Itzá, known as king Ah Nacxit, who ruled the city of Mayapán between 1263 and 1283 AD. 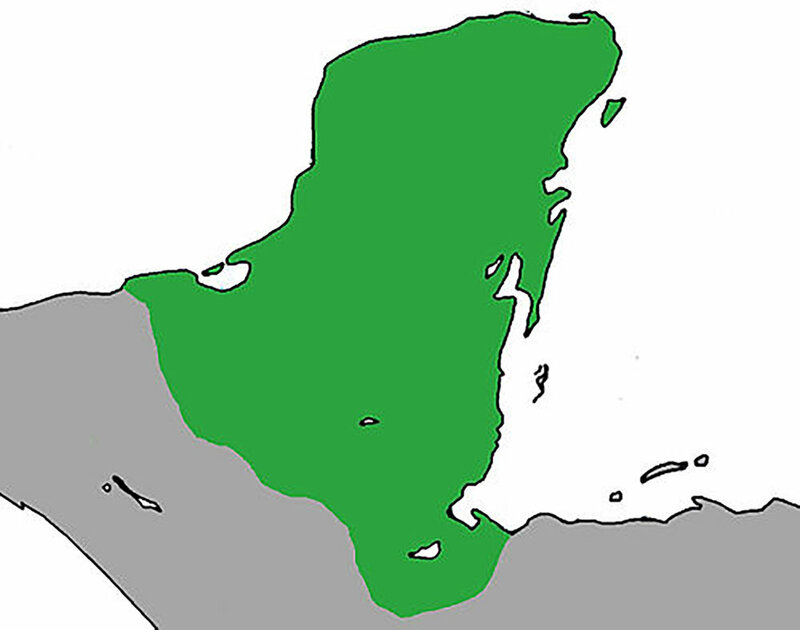 The League of Mayapán was already in place, from 987 AD (other sources give 1007 as the start of the league). The alliance unified Chichén Itzá, Mayapán and Uxmal. Chichén Itzá was then the main city of the league and they continued to incorporate other areas as their vassals, such as Zamá (Tulum), Ichpatún and Izamal. The ruins were first described in print by John Lloyd Stephens and Frederick Catherwood in the early 1840s in their book, Incidents of Travel in Yucatan. The restoration of the site was led in the 1990s by INAH archaeologist Roberto Rosado Ramírez. Maya provinces in the 16th century: wikipedia.org. The League of Mayapán, circa 1200: wikipedia.org. This site was never abandoned and thus had different inhabitants at different times. Until the Spaniards arrived, it was a typical ancient Mayan city kingdom, with its ceremonial centre and noble houses. 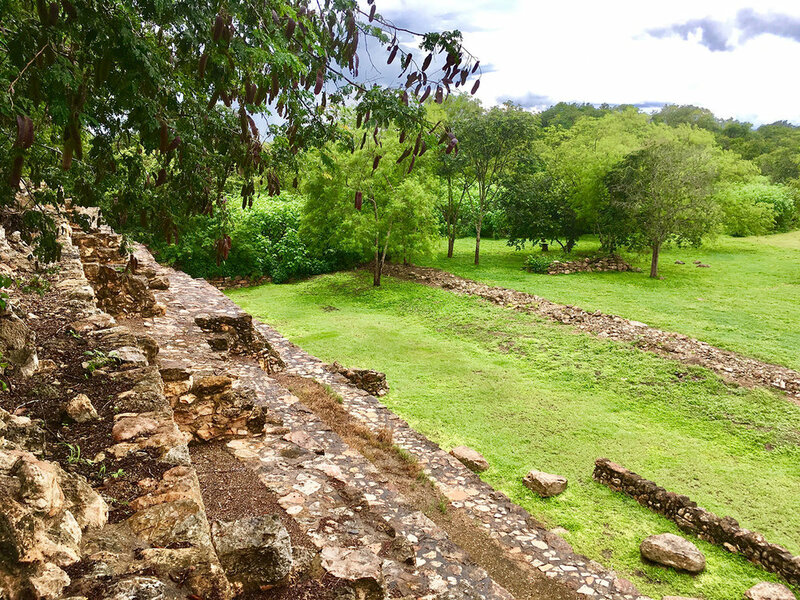 Under Spanish rule, a hacienda was built here, first dedicated to livestock and later to producing sisal fibre from henequén. So let's explore both sides of the story. The Palace: F. Catherwood, from Incidents of Travel in Yucatan (scanned). Map of sacbé roads; photo taken at the Mayan World Museum, Mérida. In ancient times, Aké people were great traders. They built a series of causeways within the city and also connecting the city with other nearby centres. The roads were made of white limestone and in the Mayan language such a road was called sacbé ('white road'). The limestone would reflect in moonlight at night, serving as a sort of flashlight. Apparently the carriers carried the goods on these roads at night (the Maya did not have horses and did not use the wheel for transport, although they knew it and used it in toys). The largest of these roads, which is almost 13m wide and 32km long (some say 25km), connected Aké with the city of Izamal. 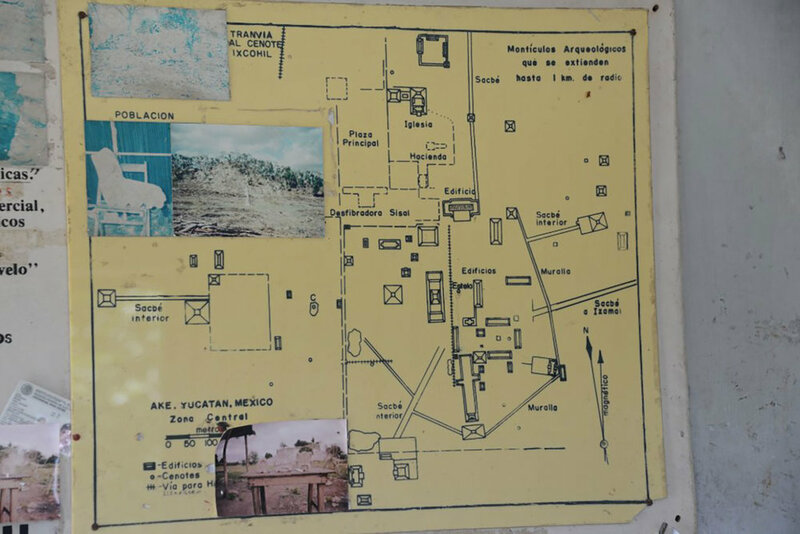 This evidences that Aké and Izamal were allies and would have maintained trade relations. This alliance was subsequently broken for reasons unknown so far. Though now mostly overgrown by jungle vegetation, this road originated at Mérida (formerly known as T’ho, also as Ichkanzihóo, City of Five Hills) and ran all the way to the Caribbean coast, a distance of nearly 300km. 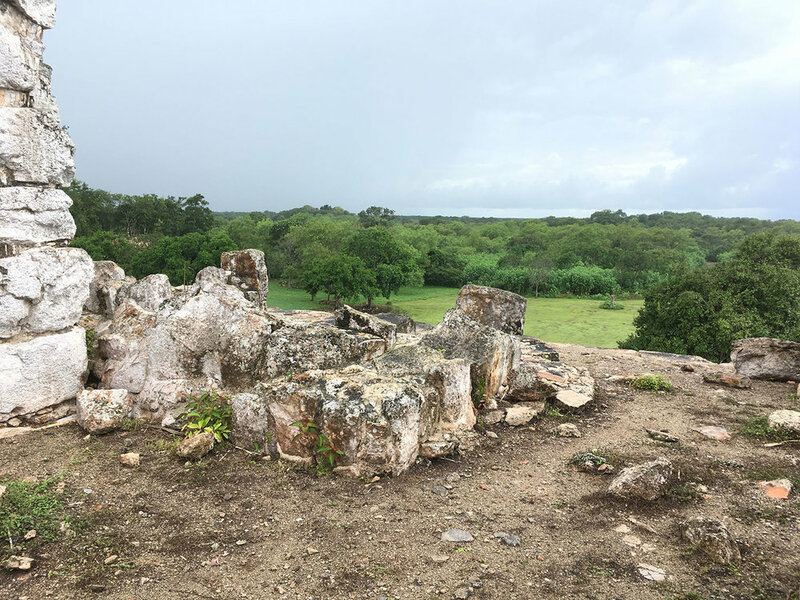 Apparently Aké was also influenced by the sites of the Bec region in Campeche and Cobá in Quintana Roo, so this would perhaps indicate trade relations as well (I could not find any reference to wars, hence my assumption of ally-trade relationships). View of the hacienda from the top of the palace. Aké played an important role in the conquest of Yucatán, carried out by the Spanish conquistador Francisco de Montejo. He arrived in Yucatán in 1527 with three ships and 400 men. He managed to conquer many Maya towns, but not without encountering a fiery resistance. At Aké, one of the decisive battles took place, where more than 1,000 Maya were killed. Despite this victory, the conquest of Yucatán would be completed only after 20 years, in 1546. John Lloyds Stephens described in his book Incidents of Travel in Yucatan the account of the march of Don Francisco Montejo from the coast. At Aké they found themselves confronted by a great multitude of armed Indians. A desperate battle lasted two days. 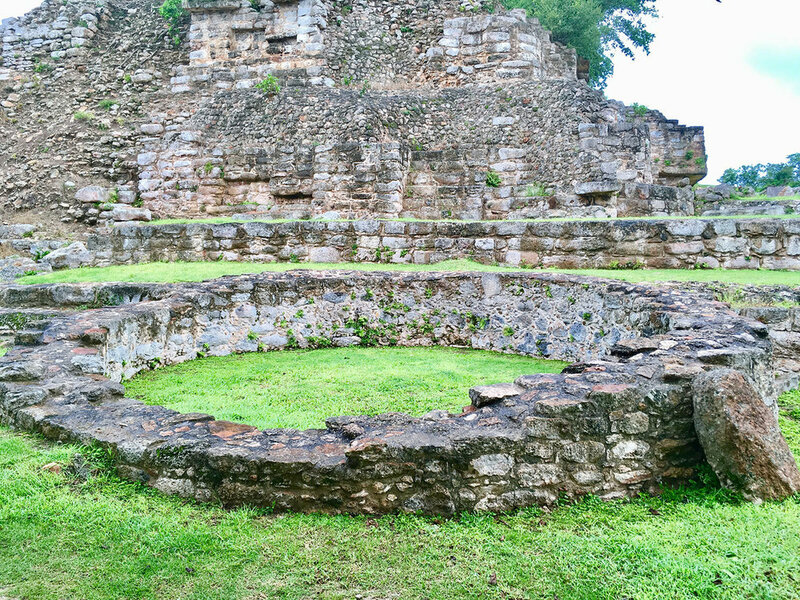 Under Spanish rule, the hacienda of San Lorenzo Aké was built literally at the ruin site, as a cattle ranch. The old Hacienda dates back to the 1600s. I can just imagine how the natives must have been astonished by all the cattle that they had not seen until the arrival of the Spanish. The rural Maya first looked after the livestock of the hacienda owner, and at a later stage they processed henequén. In the main square the Chapel was built and the process of converting to Christianity began. Theodor de Bry, Montejo captures Yucatán in 1527: akg-images.de. Aké is bounded by two concentric walls: one around the main plaza, around the ceremonial centre, and the second one around the residential area. It is unclear if the outer wall had a defensive function, but it certainly limited access to the site, since the causeways, once connecting Aké to neighbouring centres, were cross-cut by the construction of the wall. The wall was originally around the main plaza. Rhod on top of the Palace. Structure One, also called the Palace (or Building of the Columns), sits on the north side of the plaza, with rows of stone columns atop a step-pyramid platform; it is the site's most impressive feature. This is a long rectangular platform, accessible from the plaza through a massive stairway, several metres wide. The top of the platform is occupied by a series of 35 columns, which would have probably supported a roof in antiquity. The roof is now perished but at its time it would have been one of the largest roofs around. This building seems to have had a public function so perhaps it was a residential and administrative palace, a palace with a dual role (like so many others in the Puuc area). So how did the people living at this site adapt to the new way of life? How did they accept the new rules of the Spaniards and the new religion? As John Lloyds Stephen observed during his visit here in the 1840s, the rural Maya were quick to accept the Christian cross and called themselves the Cruzob (People of the Cross). They equated the Christian Cross with their yaax chel cab (Tree of Life) and considered them to be the same religious icon (well, they both look the same as the Tree of Life looks like a cross). To start with, the Maya did not have a choice, really. The common folk, who used to work for their own noblemen, had becomes slaves for the new masters on their haciendas. Many of them were also wiped out by the illnesses that the Spaniards brought with them, such as smallpox. Around 1545 a large number of missionaries were sent over from Spain, under the direction of Father Luis de Villalpando. The first baptised convert was the Indian chief of Campeche, who learned Spanish and thereafter acted as interpreter for the priests. Here, as elsewhere, the missionaries were the champions of the rights of the Indians. In consequence of their repeated protests a royal edict was issued, in 1549, prohibiting Indian slavery in the province, while promising compensation to the slave owners. In 1551 another royal edict liberated 150,000 male Indian slaves, with their families, throughout Mexico. Within a very short time Father Villalpando had at his mission station at Mérida over a thousand converts, including several Mayan chiefs. He himself, with Father Melchior de Benavente, then set out, barefoot, for the city of Maní in the mountains farther south, where their success was so great that two thousand converts were soon engaged in building them a church and dwelling. Outside the Aké hacienda chapel with our guide José. The Indians had not only adopted the Catholic faith, but on being baptised they had dropped their Mayan names and were given new Spanish names. At first glance it may look like an anomaly given the fierce resistance that the early conquerors experienced when trying to destroy their temples of worship. But the main resistance was centred in the Maya nobles rather than the rural farmers. The rural people readily accepted the holy Mother Mary, just as their ancestors worshipped an image of Ix Chel, the fertility goddess (also the goddess of weaving, medicine and childbirth). The catholic chapel at the hacienda San Lorenzo, off the ruin site. 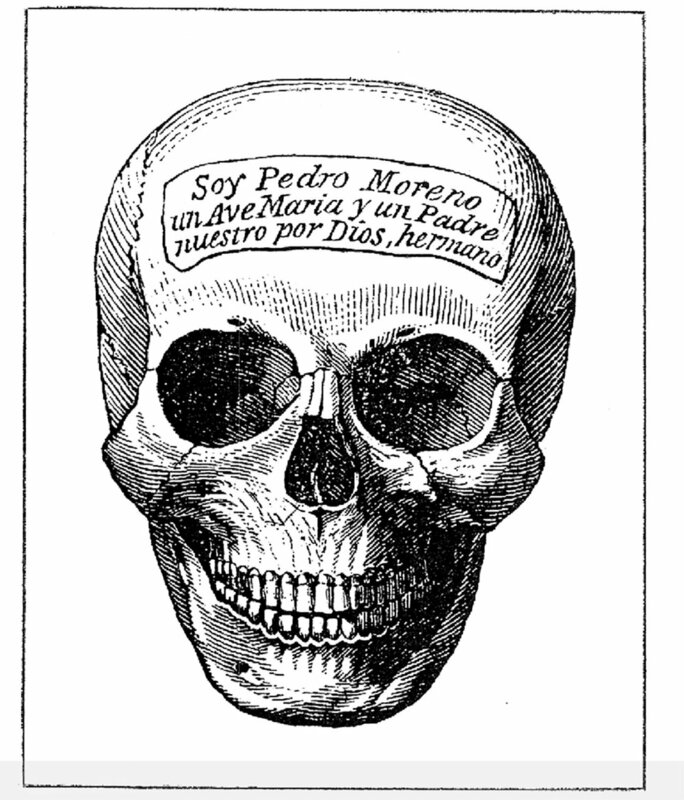 Catherwood's drawing of an engraved funerary skull from a rural Maya house, scanned from Incidents of Travel in Yucatan (1843). In many rural villages, the padre (or padrecito) conducted the new religious life of the community; he was either a dedicated Spaniard who learnt the Maya language or, more often, a devout Maya who learnt the Spanish language. Interestingly, the Maya padrecitos did not adhere to celibacy (as the catholic rules dictated) and openly maintained compañeras (they were often referred to as hermanas politicas, sisters-in-law). The catholic chapel on the village main square. 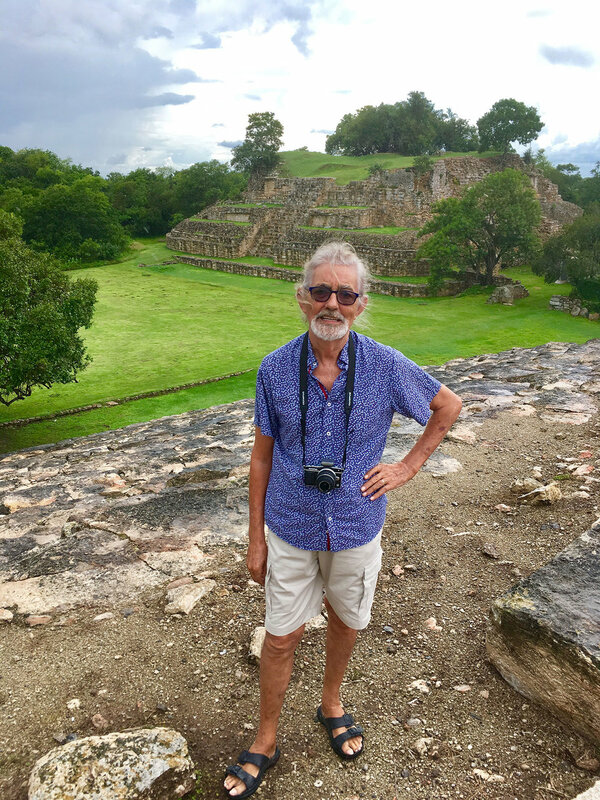 Stephens also noted a Maya burial practice around the Izamal and Aké area, common to rural Maya communities, that would have horrified the Catholic Church officials at the time. Instead of a traditional cemetery adjacent to the church, the Maya church was adjoined by a charnel house that contained the preserved and carefully displayed skulls and bones of the deceased. The ancient Maya custom of providing jewellery and food for the journey of the deceased into the other world (they believed in reincarnation), had by the 19th century been replaced with a custom of engraving the skull with the name of the deceased so that prayers were dedicated to that particular person. In 1583 and 1597 there were local revolts under chiefs of the ancient Cocom royal family. By this latter date it was estimated that the native population of Mexico had declined by three-fourths through massacre, famine, disease, and oppression. Revolts continued throughout the 17th century. When Mexico won its independence from Spain in 1821, the new government used the Yucatecan territory to create huge plantations for the cultivation of tobacco, sugar cane and henequén. The Caste War (1847–1901) was yet another revolt of the native Maya people of Yucatán against the European-descended population, called Yucatecos. The war was not officially declared over until September 1915. It wouldn’t be until 1935 that a half-hearted truce was signed. Photo from the Caste War by Pedro Guerra, taken at the Museum of the Mayan people at Dzibilchaltún. 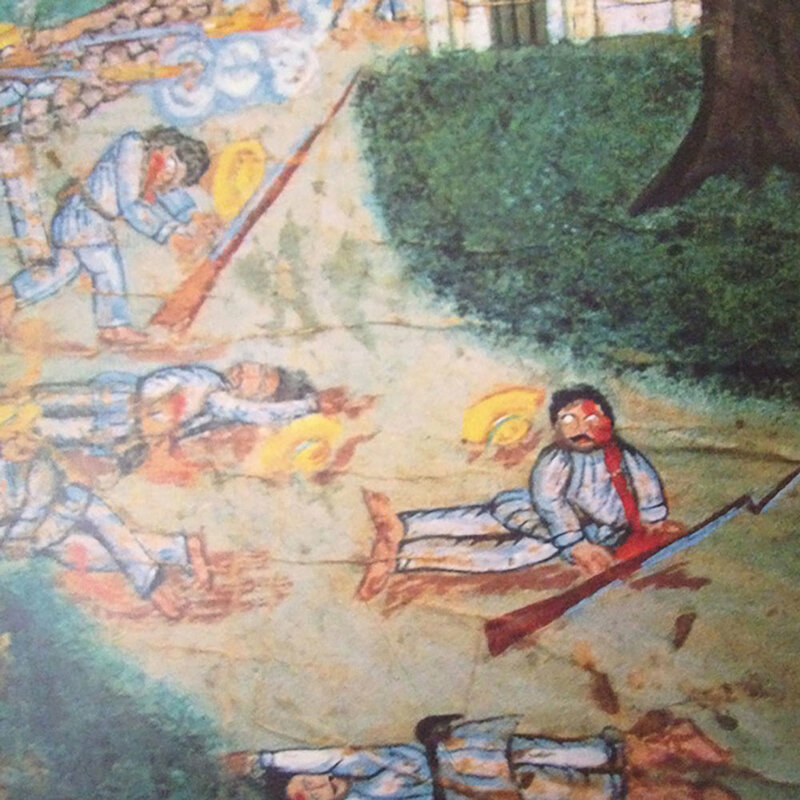 Painting of Caste War, circa 1850, from the Museum of the Mayan people at Dzibilchaltún. Only three ruins have been excavated so walk about and enjoy them in this site without any tourists. You can climb them as well. See if you can find the water source. The site had two cenotes (sink holes) but they are both dry and can't be seen today (I checked with a local at the Ticket Office). Several other smaller sinkholes provided the community with fresh water. The Long Temple at the Plaza is very elegant and also offers great views. In front of it was a round structure, and possibly remnants of a road? Round structure outside the Long Temple. 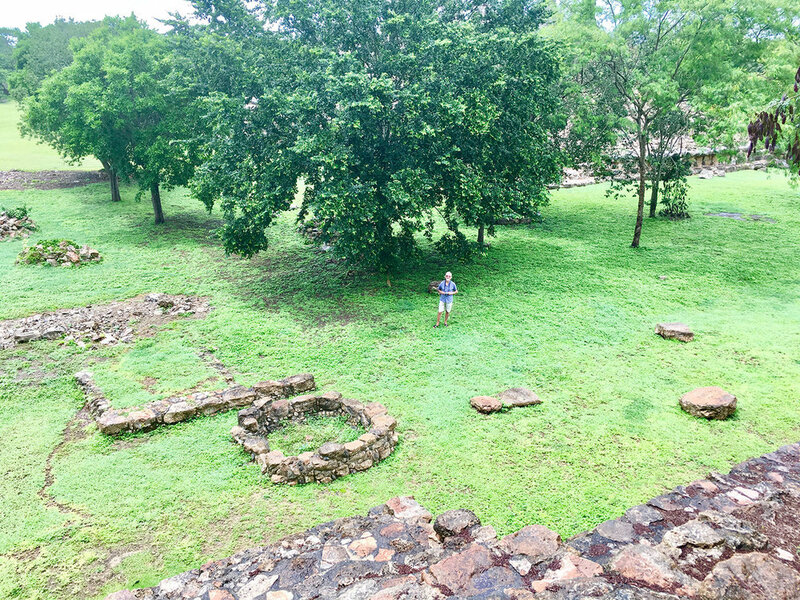 If you climb the Chultún Temple at the Plaza, you will have a great view of the plaza and you will also find a chultún on top of the building, by a large tree. The steps are pretty steep but the climb is worth it. 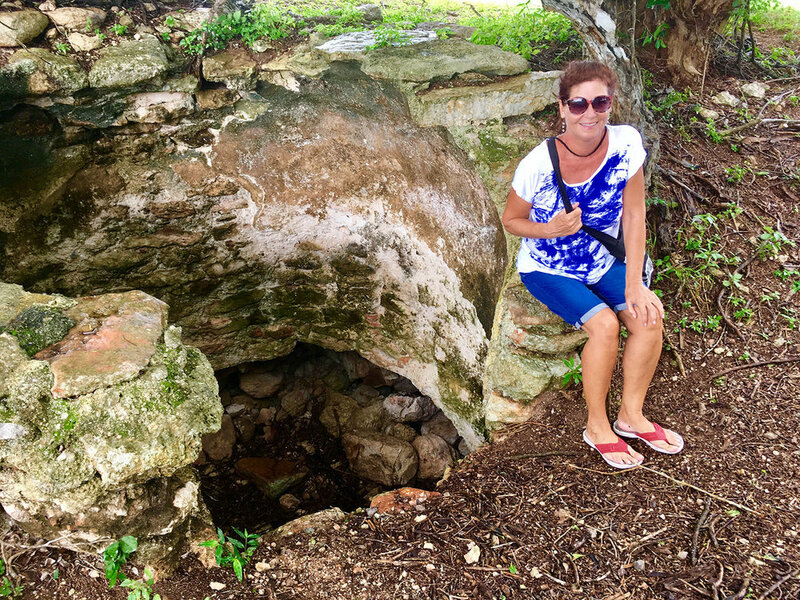 A chultún was a bottle-shaped underground storage chamber and their entrances were plastered, which guided rainwater into them during the rainy season. It was a must for the Maya in Yucatán, because the limestone here is porous and it does not retain the rainwater. I also highly recommend you visit Hacienda San Lorenzo, including its factory, as there aren't many working haciendas in Yucatán (they have mostly been turned into hotels now). The ruins are open 8am-5pm. The entry fee is $50 pesos (prices of 2018). The guide fee for the hacienda and factory was $200 pesos per person. There are bathroom facilities inside the ruin zone but no other services so bring water with you. There is no public transport to the ruins. It takes 2 hours and 45 minutes from Playa del Carmen and only 40 minutes from Mérida. Drive along Federal Highway 180, then turn off at the village of Tahmek which leads to the town of Tixkokob. When you arrive at the village of Aké, the site is located on the outskirts of the village. I was unable to find bus connections to Aké. The obvious option is to combine the visit to the ruins of Aké with the Hacienda San Lorenzo visit next door. Otherwise, you can visit the yellow city of Izamal, only a 40 minute drive to the east, or combine it with a visit to Mérida, the same distance to the west.